Proven performers in even the toughest applications. Higher flow rate generated by large, dual flow rotor. 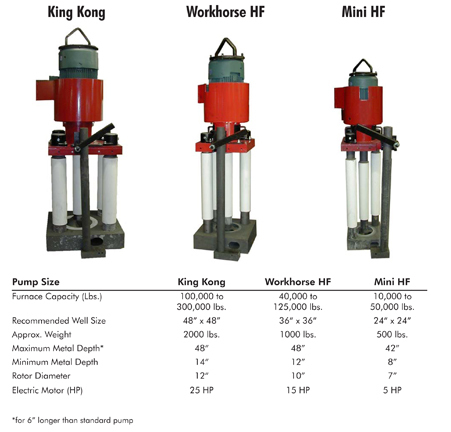 Achieve higher flow rates with lower RPM’s. Less breakage, longer service life. Higher melt rates, lower energy consumption. Lower melt losses, less dross. Fast & easy alloy homogenization of the melt. Larger, more robust parts improves reliability for less downtime and more uptime! Full ceramic sleeve protection on shaft and posts for extended service life. Pumps assemble in less than one hour! No alignment fixture required, simplifies assembly and repair. Thru-drilled post holes for fast, easy replacement of posts. Open top pump inlet, no baffle plates to clean out. Gas injection capability can be added with our unique Foot & Tube design.